Apologies if I have mentioned this before, but I suffer from a bit of a bad back. Fortunately it is not very serious, but sometimes it seems like half of my waking hours are spent trying to get comfortable. My first change was to try swept-back handlebars instead of the fairly straight risers that came with the bike. I picked up some cheap Chinese bars from eBay, which were delivered very quickly and turned out to be pretty substantial. What I gained with the backward sweep was partially lost by the decreased height (because the bars need to be angled down). Definitely more comfortable – but I needed to get them higher. There are a lot of “high rise” stems available but the one that really caught my eye was the Humpert Ergotec High Charisma – because it is the only one that I have seen that is actually shaped to flow smoothly into the top of the stem itself. I was baulking at the price until I noticed that Amazon were doing them at a serious discount – I paid just over £16! The shots above should give an idea of how it compares to the standard Giant stem. The Giant stem is marked as 100mm and 15 degrees; the Ergotec is 90mm and an unknown angle (but no less than 45 degrees in my opinion). They also offer a 110mm version. I wasn’t sure how the 90mm would be measured, but it is the distance of the centre of the handlebar from the centre of the steerer, measured along the centreline of the stem tube (rather than being the horizontal offset). Although the relatively shallow angle of the Giant stem means the horizontal offset is still close to 100mm, the Ergotec stem’s horizontal offset is much, much less. Because of the extreme angle, the Ergotec stem has a horizontal offset of only 70mm or so, and a rise from the base of the stem of about 95mm. Compare this with the Giant’s rise of 40mm. In old money, the Ergotec stem brings the bars an inch closer and lifts them two inches higher! Giant Roam – slow commute edition! Fitting was straightforward – the closed top of the stem means you can’t adjust the height using spacers (I had to use the same spacing as the standard stem in its highest setting). No concerns with the quality either – there is a neat rubber seal to protect the top bolt. Looking at the bike, I was a bit worried that this extra rise might be a bit too much… thankfully, it isn’t. A quick ride around the park has confirmed that I now have the “dutch bike” seating position I was searching for. Should make the commute a lot more comfortable! My bike left the factory with these Giant S-RX4 tyres. They are a pretty high-volume hybrid tyre at 700x40c, and for well over 6 months and 1,000+ miles of city riding they did not cause me a single problem. Then one day, I got a puncture. OK, these things happen, and it is pretty easy to repair. Two weeks later, I got another puncture. I guess there must be a lot of debris on the streets at the moment. The following week, another puncture. Starting to get a bit frustrating. The next week – two punctures – one of them on a family trail which could have easily spoiled the whole day (fortunately I had a spare inner tube after the previous repairs). I really needed to work out what the problem was. What I found strange was that the tyres did not have a huge mileage on them, and there was still plenty of visible tread. But then I noticed that small chunks of glass were getting embedded in the tread (and I mean really small – only a few millimetres across). It wasn’t taking much for these small chunks of glass to work their way through to the inside of the carcass, puncturing the inner tube. But why was this happening now and not in the previous 1,000 miles? Put simply – the tyre is pretty thin and there doesn’t appear to be any form of puncture protection. The rubber has worn down and is less than 3mm thick along the centre of the tread ( decreasing to 2mm at the edges). No wonder a 3mm chunk of glass can penetrate the carcass! Goes to show that even a tyre with a visible tread pattern could be worn beyond its useful life. Naturally, I decided that I had to buy some new tyres. The two most popular puncture-protected brands seemed to be Continental and Schwalbe. You can normally count on German engineering. I chose the cheapest ones I could find and settled on the Continental Contact II. While I was waiting for them to arrive, I got another FOUR punctures in just one week! Fortunately, the Continental’s have yet to cause me a single problem. And I daresay that they feel a little faster! Since Google Now has been spamming me with this article for the last few days, I feel it is appropriate for me to respond. road.cc may well be a road bike site, but their suggestions for “Commuting bike of the year” are frankly ridiculous. My rule for the road is pretty simple – assume every other road user is an idiot who hasn’t seen you. And since you are surrounded by idiots, you need to be able to see them, and you need to be able to avoid them. Flat bars are the only way you can do this – your head is up, and your fingers have good control of the bars and instant access to strong braking. Disc brakes are preferred. Drop bars were born from racing and that is where they should stay. You’re going to want to carry stuff around. Don’t carry it around on your back. Buy a bike with the right mounts, fit a rack and make the bike take the strain. It’s going to rain. You don’t want to get mucky. Fit mudguards. You’re going to go up hills. You’ll need gears. More than 3. Run chunky tyres. 35c and above. Skinny road-bike tyres were built for racing. They are hard to keep inflated, uncomfortable, and prone to punctures. There is a reason why the “hybrid” bike was born. I bought a Giant Roam and added racks and panniers to make the perfect commuter. If I stop off at the supermarket, I can get a few days of family shopping in the panniers. If I want to go for a fast fitness ride, I can do that as well. You don’t need to spend a lot on a well-equipped modern bike – my Giant was in the sale and ended up costing about £400 once I had added the rack and mudguards (half of what road.cc are suggesting you spend). Alternatively, look out for an 80s/90s rigid mountain bike. Pretty much the same as a hybrid, and because they are unfashionable, they can be dirt cheap. They might not have the mounts for racks and mudguards, but “universal” mounts are available that will clamp around the frame. My Raleigh Nitro cost me £25, and after a few tweaks and a few repairs it was a solid and reliable commuter that had many more miles left in it! So, after 18 months of cycle commuting (and riding a lot more in between), I’ve finally treated myself to a modern bike. I had considered many options (too many in fact), and in the end made a snap purchase of the best value big-name disc-braked bike I could find, for the simple reason that my rim-braked bikes scared me a little too often on rainy winter days. I settled on a 2015 Giant Roam 2 which cost me a little under £330 in the sale. I am very pleased with it so far. The SR Suntour suspension forks do have mudguard mounts, but they are not in the usual place – they face rearwards. SKS do make some angled brackets to suit (99p each), and although I ordered one (not the required two! ), I couldn’t be bothered to wait so I picked up two 25mm angle brackets from Wilko’s cabinetry section and they work just fine. I grabbed what hardware I had to hand which means these are M5 posidriv screws rather than socket head allen bolts but I may replace them at some point. The crown mounting is standard but because it is relatively far forward, I needed to bend the bracket on the mudguard to stop it from running too close to the tyre. One thing to note about the “Commuter” mudguards is that they are not full length (only about 135 degrees on the rear) and don’t have a reflector. Although I think the shorter look suits a “dual-sport” bike like the Roam, pure road commuters might be better off with a full length design. Another point is that the Giant’s own-brand 40C tyres have knobs on the side which make clearance tight on the 45mm guards. They do however have a smooth centre tread and roll very well on tarmac. The D-lock is an ABUS model that was only £15, the lighting is by Cateye. The pedals are Ergon PC2-L (which I find ideal for riding in normal shoes, although they are not exactly cheap), and I’ve also replaced the quick release skewers with Halo bolt-through ones. Since taking these shots I have fitted the Pletchser Comp Zoom rear kickstand, which has holes at the 18mm centres required for the mounts on the rear dropouts. A couple of M6 bolts from the hardware shop are needed to attach it (20-25mm would be ideal). All in all a great do-anything bike for round town and unmade paths. What do I like about the levers (Dia-Compe’s DC139, in case you were wondering)? I like the aesthetic, and the way they keep that clean curve of the front of the drop bar. I like the quality of Dia-Compe’s finish. I like the concept of providing brake control on the parts of the bar you use the most (the tops and the “shoulders”). What don’t I like about them? Broadly speaking – the braking. The part of the lever you can access from the tops does not allow you to get enough leverage to do anything more than feather off speed – it requires a lot of force to even come to a standstill. The part of the lever you access from the “shoulders” (there are no hoods on this style of bar) gives more leverage, but you can’t use your the full strength of your fingers because you’re using a lot of your strength to kep control of the bars as a result of the very small contact point on the shoulder. I had them on a bullhorn bar before and the same criticisms apply – look good, but can’t be counted on to stop you with confidence. This old racer is just a project bike for me, but these levers aren’t the solution for a bike that I can actually enjoy RIDING. Brooks know how to make a purchase feel special. It’s something of an anachronism that these ancient leather saddles are still hugely coveted more than 100 years after they first appeared. And although you (can) pay a lot of money for a Brooks product – getting it in your hands makes it worth every penny. Not only do you get the product itself – carefully constructed from leather and metal – you get the elaborate cardboard box with a sliding insert, the old-fashioned instruction manuals (which only just fall on the right side of pastiche), and the elegant detailing. 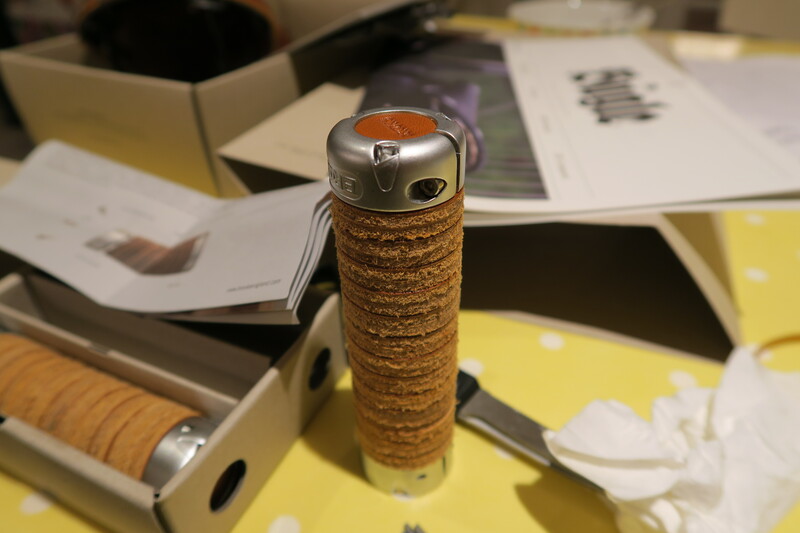 Although the packaging costs a relatively small amount, it makes the product feel special. And somehow you don’t mind the cost so much. 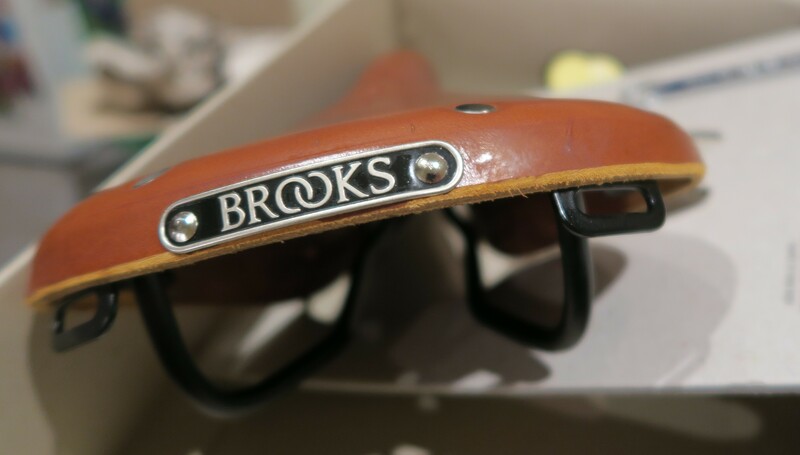 On the topic of cost – had I purchased the saddle alone (a B17 Honey) in Brooks’ equally stylish shop in Covent Garden it would have cost me at least £86.99. By ordering it from bike-discount.de, I got the saddle AND the plump grips AND the Proofide pot for a shade under £100. Ordered on Monday morning, in my hands on Wednesday afternoon. Very impressive. What’s this – ANOTHER bike??? As time has gone on, I’ve become a bit clearer about what I want from a bike to commute on. And riding at a leisurely pace in work clothes it what suits me best. And what better way to ride in gentleman’s work clothes than on a gentleman’s bike? 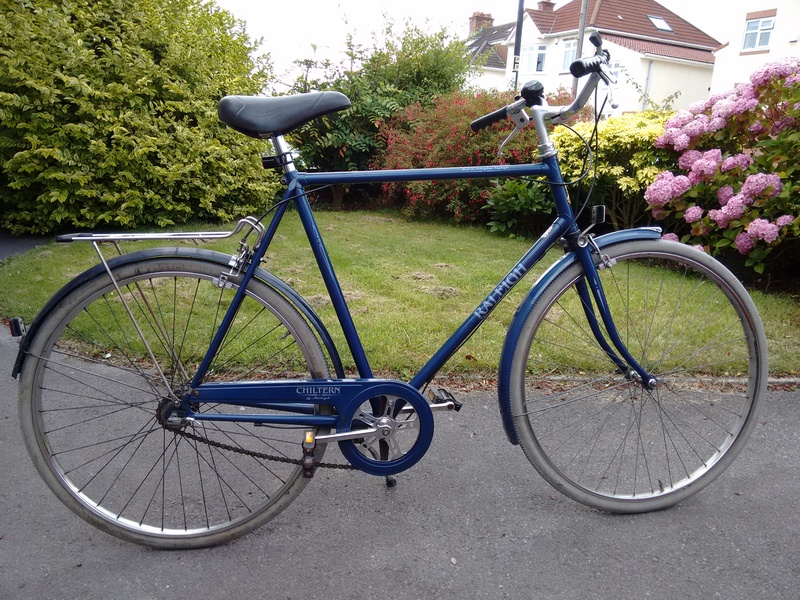 It’s a Raleigh Chiltern. I’ve done some digging around and despite appearances it is not as old as you may think – dating from the early 90s. I suspect it was a retro-influenced release at the time, because the parts on it are a strange hybrid of 50s and 80s technology. The (steel) wheels are the old-fashioned 26 x 1 3/8″ size, the fork has the trademark Raleigh “thimbles” on it, and the brake calipers are all-steel and British made. Yet the brakes are Lee Chi and the saddle is made of perhaps the least comfortable foam-padded plastic they could have found. This particular bike came with the Shimano 333 rear 3-speed hub gear. Again, a bit of digging suggests it is not the original equipment, and there are a few clues as to why. Firstly, the rear wheel rim is a different brand to the front. 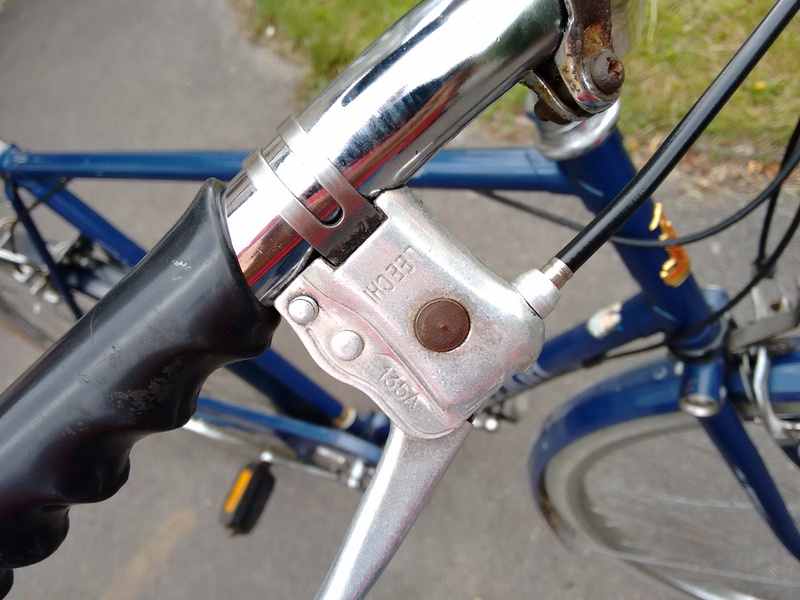 Secondly, the gear change lever on the rear axle is not well integrated into the cable (just clamped through), and the gear shifter is a ratcheting lever from something else entirely. UPDATE: After sleeping on it I’ve managed to get the hub back together but it runs roughly. Now that I know there are missing/disintegrated parts, I’m not keen on riding it in this condition! Putting that disappointment aside, the bike itself is exceptionally nice to ride. The contact points could be more comfortable but the ergonomics are great – I really like the upright position that the swept-back bars give you. Since this bike suits a steady pace, I don’t end up as a ball of sweat. I’m surprised more British commuters don’t do the same. I have some improvements planned and will update you if/when they happen!